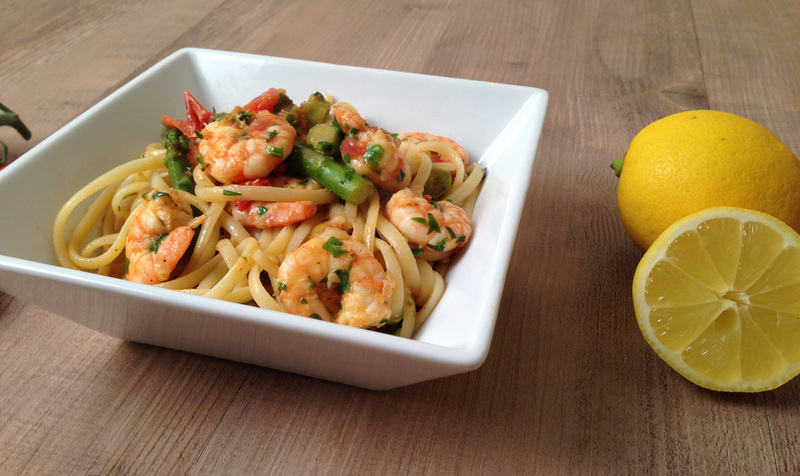 This shrimp linguine is a beautiful spring dish, perfect for some al-dente dining. The lemon and asparagus make this dish fresh and light and you can add as much chilli as you want, for a spice level that is perfect for you. Fill a saucepan with water and bring to the boil. Add in your pasta and cook for 10-12 minutes (see instructions. Whilst you pasta is cooking, put a large frying pan on medium heat and add in your olive oil. Throw in your tomatoes and fry for 4 minutes. Then add in the garlic, chilli, asparagus and shrimp and cook for another 2 minutes. Pour in the white wine and add the salt, pepper and oregano. Leave this to simmer for 3-5 minutes, until the sauce reduces and thickens. Once cooked, drain the linguine and add to the sauce. 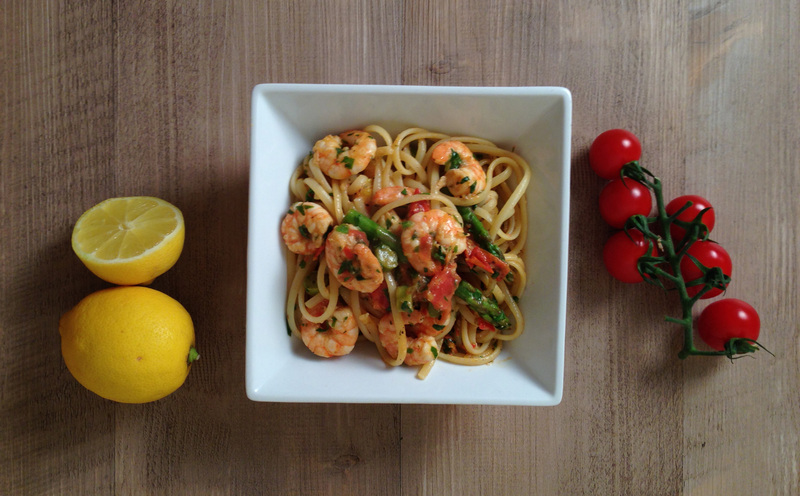 Add the lemon juice and basil to your linguine and heat for 1 minute, before plating up! Maybe I missed it. but how much white wine is required? Also, can you recommend a substitute for the wine? Thanks! Hey Joy, it’s half a glass of white wine. If you don’t have any white wine then you can just add a splash of water (50ml) to keep the moisture in the sauce. White wine works really well though (doesn’t need to be expensive stuff!). Made this tonight for my partner and my fourteen year old son. It wNt down a great and we all loved it. Thank you! Glad you and the family liked it, Richard!